1 fl oz (29ml) bottle contains 300mg of all-natural bacon flavored hemp-derived CBD extract. Serving sizes will vary according to the size of your pet. Consult the chart on the product label to find the serving size right for your pet. 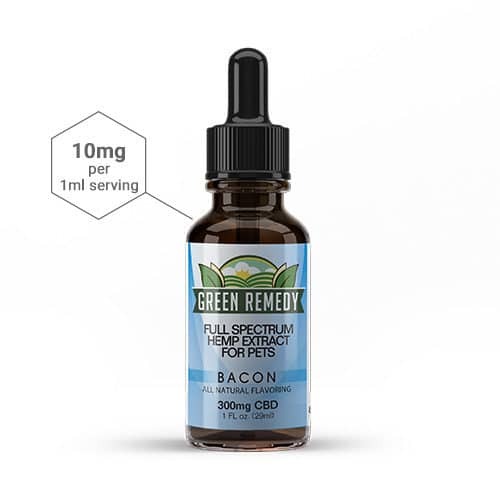 The 300mg Green Remedy Full Spectrum Hemp CBD Extract For Pets is effective and all-natural and contains all-natural bacon flavoring your pet is sure to love. 100% American made. Nothing imported! 1 fl oz (29ml) bottle contains 300mg of hemp-derived CBD extract. Serving sizes and CBD/serving will vary according to the size of your pet. Consult the serving size chart on the label to find the right serving size for your pet. Shake bottle well before each use. Give your pet one (1) serving size by mouth (orally) according to the chart on the product for your pet’s size 1-2 times daily or as recommended by your health care professional. The first serving should be taken in the morning.